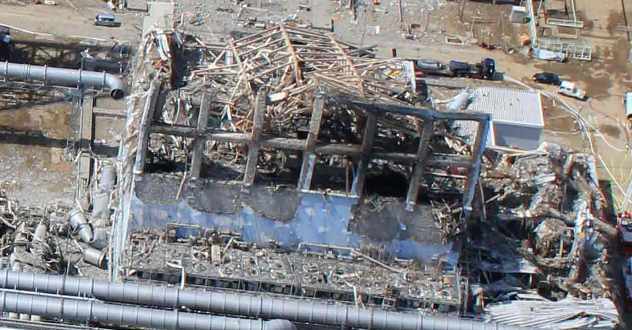 Three years ago, on March 11, 2011, a catastrophic failure at the Fukushima Daiichi nuclear power plant occurred. Three out of the six nuclear reactors in the plant melted down when the area was hit by a tsunami, which occurred as an after-effect of an earthquake. The 2011 catastrophe was the largest nuclear disaster since Chernobyl in April 1986. It is one of only a scant few to measure a level of seven on what is known as the International Nuclear Event Scale. Radioactive materials have now been leaking out of the Japanese plant for over three years. Finally, a new method to probe the interior damage has emerged, allowing experts to perhaps soon have an idea of the extent of the Fukushima calamity. Even while nuclear leakage continues to occur, clean-up of the melted reactor cores remains impossible. To make matters worse, the buildings were made out of steel and concrete so thick that imaging technology such as x-rays are unable to safely scan the site. Experts believe that the three reactor cores melted down, twisted and formed into odd shapes in confined spaces. They believe that the now-re-solidified reactors may currently be wrapped around parts of the building where they were never intended to be, including some structural elements. There is no confirmation of any of this, however, and it is currently only estimates and conjecture, because the systems used to measure the buildings’ interiors have been offline since several days after the incident. Until the damage can finally be probed, Fukushima remains a mystery. Experts agree that clean-up needs to occur. The accident happened, radiation continues to leak from the site and the buildings remain as they were since it all began. In order to clean up, custom-made tools will be required which will be based upon the actual environment and parameters of the accident. A new technology that may be able to provide three-dimensional images of the buildings’ interiors and the wrecked reactor cores appears to now be available. Toshiba, the initial clean-up contractor, and the Los Alamos National Laboratory will deploy a technology that the Energy Department has been working on for a number of years and has already licensed to a Virginia-based company which uses it to screen shipping containers for smuggled items that might be used to build nuclear bombs. While the version to be used by Toshiba and Los Alamos National Laboratory will employ a slightly different methodology, one which will focus less on the detection of uranium or plutonium and more on mapping the location of deposits, the technology and concept is similar. The technology will utilize the special properties of muons, which are subatomic particles. Muons travel at close to the speed of light and can penetrate hundreds of feet into the earth. The muons will be targeted toward the interior of the buildings with exteriors too thick to be penetrated by x-rays. While there is a slight similarity between x-rays and muons, the actual physics of the project is very different. The exposure, which will yield a usable image, cannot be done quickly, and the muon tomography could require weeks before producing a useful image. Project coordinators indicate that time is not the most important factor. The necessary information and imagery must be obtained before efforts to clean up the mess from the accident can move forward. Therefore, the possibility of the muon tomography requiring weeks before completion is of less import than the type and quality of the images provided. Testing is set to begin later this year, with final images being produced some time in 2015. Scientists expect to be able to distinguish between such things as structural components, plumbing and meltdown by-products. If all goes as planned, the damage which occurred at the Fukushima plant will finally be able to be probed and imaged, which will be the first step in what can already be considered a lengthy clean-up process. One Response to "Fukushima Damage Finally to Be Probed"
TEPCO the negligent Japanese power company that allowed this disaster to happen by not relocating the reactor coolant generators to safe high ground after they were told to make them safe years before the disaster hit is still being negligent while lying to the people about just about anything you can think of while they continue to dump millions of gallons of radioactive poison waste into the Pacific Ocean for the fish and sea life to ingest each and every day! The radiation is building up into toxic amounts very quickly! Anyone eating Pacific fish or seafood should consider doing a radiation and heavy metal detox with the natural mineral called zeolite that has been proven to safe;y remove both radiation and heavy metals from the body! For more information on this important detox do an online search for the single word Zeolite.